And it’s definitely one where the basic plot is known to everyone: baby princess is born with milky complexion, jet black hair, bright red lips. Mom dies, father remarries, evil queen outlives the dad, and the girl, who is now in her teens, is taken out to the forest to be killed. Meets seven little men, eventually beats the queen, and lives happily ever after. So how do you make a new version of this classic tale? Especially when there is one version (Walt Disney’s 1937 masterpiece Snow White and the Seven Dwarfs) which has become the mainstream version? 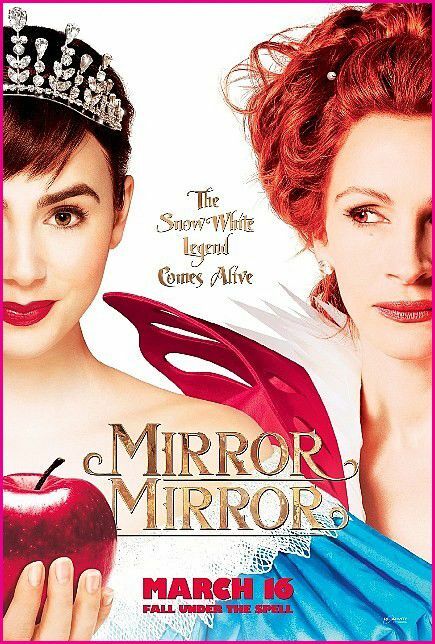 The new film Mirror, Mirror does it with charm, grace, beauty, and lots of humor. A thoroughly charming version of the classic story, it is definitely star-studded (Julia Roberts as the Evil Queen is the headliner, while Nathan Lane does his usual–but funny–shtick as a loyal sidekick) and full of great costumes, but it is also quite funny. And thoroughly, completely charming. It’s a sweet version of the tale, with genuinely nice characters. It doesn’t go for an ironic take, nor does it subvert the story in order to be hip. Yes, it throws in a few modern words to keep things fresh, but the language doesn’t get much worse than “jerk” or “twit,” and the big kiss between the prince and princess is treated as something to be treated with genuine tenderness and respect. The plot has been outlined above, and it doesn’t deviate much from the basics. But how it treats those basics, especially in a day and age when even family films are full of “ironic observations” and cheap contemporary gags (for perfect examples, watch 99% of the films from Dreamworks Animation, especially the dreadfully unfunny Madagascar series, which is sadly getting a third sequel), is what makes the film a delightful surprise. I wasn’t expecting much going in to our special advance screening last night. More of a night out with the family where it wouldn’t cost us an arm and two legs to take our family of six to the movies. But by the end of the film, I was surprised at how much I found myself smiling. I was completely, utterly, and totally charmed. Julia Roberts is quite good in a villainous role and it is good to see her acting again. It takes time for audiences adjusting to the Pretty Woman being a bad guy, but she is both funny and nasty when the film calls for it. She does flash that winning smile–sadly, it’s when he wicked plans come to fruition–and her interactions with Nathan Lane and the rest of the castle staff are quite enjoyable. Armie Hammer also turns in a nice (and I mean that in the best sense of the word) performance as Prince Alcot, who meets Snow White in the woods, falls in love, but then becomes the object of the Queen’s desires. He shows a comedic side not evidenced in his last major role (The Social Network ) and throws himself into the physical side of the humor as well when a love potion used by the Queen has some unfortunate side effects. The costuming by Eiko Ishioka is stellar, the music by Alan Menken is appropriately Disney-esque, and the special effects never threaten to overwhelm the story–which is usually the case in these types of films. It’s a completely charming film in every way. Highly, highly recommended.